Breast cancer is the most common cancer in women worldwide (second most common cancer overall) and represents about 25% of all cancers in women. Unfortunately, resistance to chemotherapeutic agents is a significant issue in the management of these patients. Moreover, women with breast cancer who are overweight or gain weight after diagnosis have a shorter disease-free survival, a higher mortality and a decreased response to chemotherapy, relative to their lean counterparts (De Angel et al., Cancer Biology & Therapy, 2013). 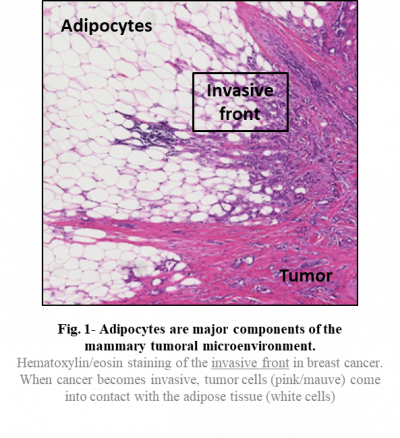 The study of adipose tissue (AT) is all the more interesting in the breast because AT is a major component of the breast tumor microenvironment. Our team has been among the first to characterize the modifications of tumor surrounding adipocytes (we named them CAAs for Cancer-Associated adipocytes) (Fig. 1), that exhibit altered phenotype, especially with delipidation by transferring free fatty acids in tumor cells. CAAs contribute to breast tumor progression by stimulating local and distant invasion. We aim to study the role of adipocytes in breast tumor cell resistance to chemotherapy like doxorubicin, which remains to be among the most active drug to date in breast cancer therapy. We recently demonstrated that CAAs could confer resistance to chemotherapy due to the transport-associated major vault protein (MVP) (Fig. 2). 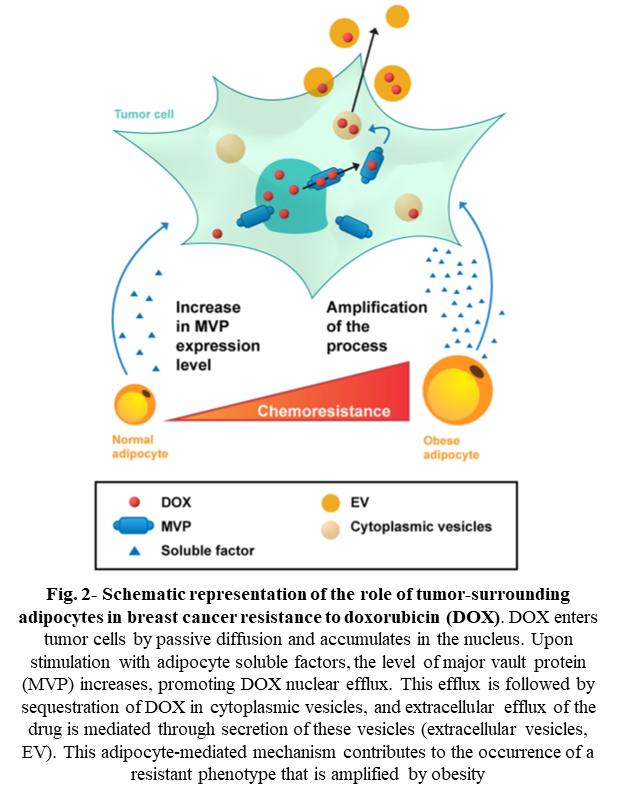 In a series of human breast tumors, we observed a gradient of MVP expression, which was higher at the invasive front, where tumor cells are at close proximity to adipocytes, than in the tumor center, highlighting the clinical relevance of our results. High expression of MVP in these tumor cells is of particular interest since they are more likely to disseminate to give rise to chemoresistant metastases (Lehuédé et al., 2019). In parallel, concerning the cross talk between mammary adipose tissue (MAT) and breast cancer progression, we want to understand what happens in a context of obesity by using MAT and isolated adipocytes from human sources, obtained from patients with different body mass index (BMI). Based on this topic, our lab develops translational projects in link with different oncological departments, especially surgery, medicine and pathology at the Institut Universitaire du Cancer de Toulouse-Oncopole. Our strong collaboration let to validate our basics results on cohorts of patients who suffers breast cancers.